The Investigators must get together once more in order to stop this ancient evil from taking over the everyday world. That's what you'll be doing in Masks of Nyarlathotep, the newest expansion for Eldritch Horror, which you can pick up now. If it's not one thing, it's another. Just as soon as you've defeated one cult, another seems to pop up. One ancient terror from beyond is thwarted, another jumps in to take its place. But, if we don't want all our brains to melt from insanity, you've gotta keep doing your job as Investigators. In the Masks of Nyarlathotep expansion for Eldritch Horror, Fantasy Flight introduces a new Campaign Mode for the game. Can you make it through 6 missions in a row? 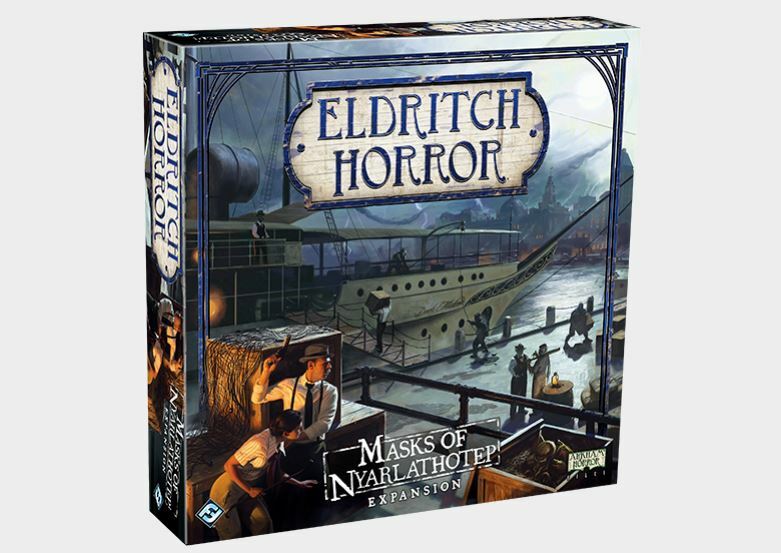 Another classic is being brought to your tabletops with Masks of Nyarlathotep for Eldritch Horror. But more than that, there's also going to be a new edition of the Call of Cthulhu adventure, updating it to the current 7th edition rules. So it's sort of a two-for-one update here. Cults all over are worshiping a single, horrible entity. It's up to the investigators to put an end to their profane rituals before all the world is destroyed (isn't that just always the case? ).